Chest radiograph of HIV-infected patient with PJP shows diffuse patchy infiltrates with predominantly perihilar and interstitial prominence, as well as a few pneumatocoeles up to 1cm in size. Courtesy of Radiopaedia (https://radiopaedia.org/), case of Dr Andrew Dixon, rID 9613. Chest CT of HIV-infected patient with PJP shows early findings of diffuse ground glass opacities, and chronic findings of linear opacities and thickening of interlobular septa. Courtesy of Radiopaedia (https://radiopaedia.org/), case of Dr Yune Kwong, rID 26697. 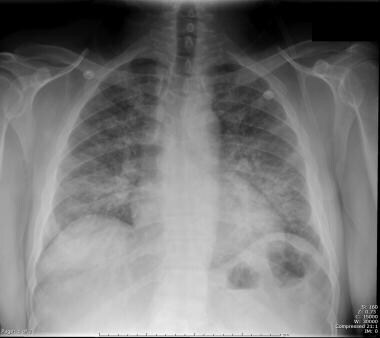 Pneumonia in immunocompromised is often complicated by superinfection, drug toxicity, empyema, sepsis, pneumothorax, and acute respiratory distress syndrome (ARDS). The number of potential pulmonary pathogens is increasing as a result of new immunosuppressive therapies, the emergence of multi-drug­-resistant organisms, and improved diagnostic modalities. There are four major groups of pathogens responsible for pneumonia in immunocompromised patients. Depending on the underlying immune defect, the likelihood of each of these etiologies for infection is varied. Fungal: Pneumocystis jirovecii, Aspergillus fumigatus, Candida, Cryptococcus neoformans, Mucormycosis species, and other fungi including Coccidioides immitis and Histoplasma capsulatum. HIV is considered to be the greatest risk factor for TB. Patients with HIV are more likely not only to contract TB, but progress from latent to active TB. In addition, they have a higher mortality risk from TB. Chest radiograph in a patient with HIV infection and focal infiltrates due to tuberculosis. In a nosocomial setting, Pseudomonas aeruginosa, Staphylococcus aureus, Klebsiella pneumoniae, and Enterobacter species are common. Fungal pneumonias are divided into opportunistic (i.e. PCP, Candida, Aspergillus, Mucor species) and endemic (Histoplasma capsulatum, Coccidioides immitis, Cryptococcus neoformans). Pneumocystis jirovecii infection remains the most common opportunistic infection among patients with HIV. It becomes a concern in individuals when CD4 count drops below 200, which is when prophylaxis with Trimethoprim-sulfamethoxazole (TMP-SMX) is recommended. When the A-a gradient is >35 or a room air arterial blood gas pO2< 70, adjuvant corticosteroids are recommended. Invasive aspergillus pneumonia is one of the four aspergillosis syndromes that primarily affects immunosuppressed individuals. In solid organ and hematopoietic transplant patients, there is a bimodal distribution of incidence with peaks during 1. prolonged neutropenia before engraftment and 2. in later stages with corticosteroid therapy in treatment of graft-versus-host disease. Most cases are the result of the reactivation of a latent infection. For the immunocompetent host, histoplasmosis is frequently asymptomatic or self-­limited. In the setting of HIV/AIDS, this infection is much more common and frequently progresses to disseminated disease. This infection is endemic to certain areas of the United States, particularly in states bordering the Ohio River valley and the lower Mississippi River. Coccidioides immitis is an organism endemic to large parts of the southwestern United States. Strongyloides is an human intestinal nematode which can reproduce and persist in the body indefinitely, and affects millions of people worldwide. In immunocompromised individuals, this autoinfective cycle can be amplified into a hyperinfection syndrome. Increased parasite burden migrates rom the gastrointestinal tract, where it causes GI bleeding, into a systemic process. Filariform larvae have been found in the respiratory system, where they cause respiratory distress and sepsis secondary to pneumonia, and the neurological system causing meningitis. 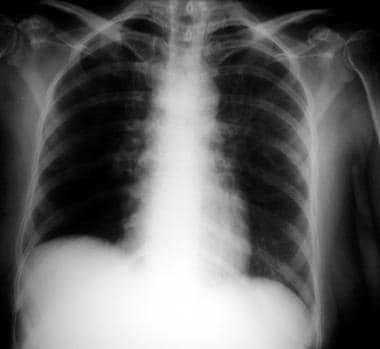 Chest radiograph demonstrating diffuse bilateral infiltrates in a patient with Pneumocystis carinii pneumonia. 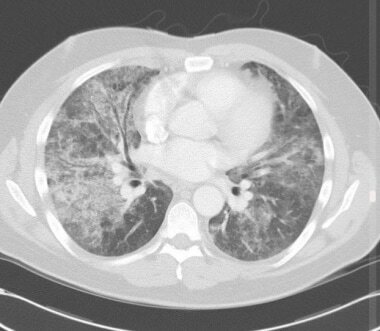 High-resolution computed tomography scan obtained through the upper lobes in the prone position in a patient with a history of Pneumocystis carinii pneumonia. This image shows parenchymal and subpleural cysts and patchy fibrosis that resulted from the Pneumocystis carinii infection. Chest radiograph in a patient with HIV infection, bilateral perihilar infiltrates, and Pneumocystis carinii pericarditis. Patients with profound, prolonged neutropenia are more susceptible to invasive fungal pathogens such as aspergillus species, and the agents of mucormycosis. Viruses are also involved, primarily VZV. Respiratory viruses such as influenza, respiratory syncytial virus (RSV), Adenovirus, and Metapneumovirus are increasingly documented in neutropenic patients. 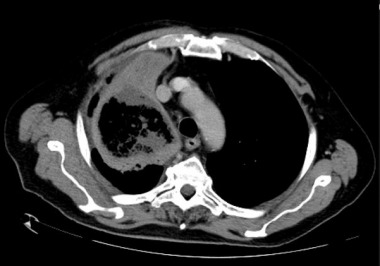 CT of AML patient with a fungal pneumonia in the right upper lobe characterized by a cavitary lesion without air fluid levels. Courtesy of Radiopaedia (https://radiopaedia.org/), case of Dr Roberto Schubert, rID 17628. Solid-organ and bone-marrow transplant patients have a heightened risk of pulmonary infection as well. The specific organ, timeframe since transplant, and use of immunosuppressive medications are all important in predicting these complications. CMV pneumonitis is common in solid organ transplant, particularly lung, recipients. The risk is higher if the donor is seropositive and the recipient seronegative. Interestingly, the opposite is seen in hematological stem cell transplant (HCT) patients, where there is a higher risk for CMV pneumonitis among seropositive recipients transplanted with seronegative stem cells. Nocardia species are another notable cause of pulmonary infection in organ transplant patients requiring long-term immunosuppression. Reactivation of viruses causing pneumonia is a large concern in HCT patients, even in autologous transplants. Human herpesvirus 6 (HHV-6) reactivation is most common (seen in up to 60% of patients), followed by EBV (up to 30%). [36, 37, 38] . Solid organ and HCT recipient are at risk also of hyperinfection with Strongyloides stercoralis, which may be accompanied by gram-negative bacterial sepsis and pneumonia. Infections in persons with autoimmune conditions can result from the effects of immunosuppressive therapies as well as their underlying condition. In systemic lupus erythematosus (SLE), distinguishing infection from an autoimmune flare is important. Treatment with steroids in the setting of infection could be deleterious. The large majority of infectious complications are due to bacterial pathogens. Viral infections (CMV, VZV) are also common. Persons with primary immunodeficiencies are susceptible to pulmonary infections, the spectrum of which is largely determined by their underlying immune dysfunction: humoral, cellular, or combined deficiencies. Humoral immunity deficiencies impact the ability to create functional antibodies. Characteristic infections are bacterial-based, recurrent, upper and lower respiratory tract infections. Common pathogens include the encapsulated bacteria Streptococcus pneumoniae, Haemophilus influenzae type b, and Neisseria meningitidis, as well as Giardia, Cryptosporidia, and Campylobacter. Cellular deficiencies affect T-cell development and function. Dysfunction of T cells invariably has an impact on B-cell activity; therefore, most of these conditions manifest as combined deficiencies. Infections are common from viruses (RSV, HSV, VZV, CMV, EBV, influenza), mycobacteria, and fungi (Candida, Cryptococcus, and Pneumocystis). Steroids alter phagocytic function of alveolar macrophages, delay the mobilization of immune cells, and affect antigen presentation. The underlying cause of immunosuppression is a crucial aspect of the history. Pulmonary findings may be nonspecific in immunocompromised patients. Laboratory studies that should be obtained include a complete blood count (CBC) with differential, basic metabolic panel, arterial blood gas (ABG), lactate dehydrogenase (LDH) level, erythrocyte sedimentation rate (ESR), and C reactive protein (CRP). If tuberculosis is suspected, sputum culture, sputum Gram stain, acid-fast bacillus (AFB) smear, and AFB culture should be collected while patients are in isolation. Two sets of blood cultures, despite their low yield and infrequent impact on care, are considered standard of care. [47, 48] They are especially important in immunosuppressed individuals as they may at times be the only objective finding of infection. Chest radiography is usually the initial imaging modality. The timing, progression, and distribution of findings are helpful in identifying correlations. The most typical findings on chest radiography include infiltrates with consolidation, peribronchovascular lesions, and nodular space-occupying lesions. Other findings include atelectasis, cavitation, pleural effusions, lymphadenopathy, and cardiomegaly. Some findings are correlated with certain etiologies of pulmonary infection; however, the pattern of radiographic findings is often unreliable in immunocompromised patients given the decreased inflammatory response. CT is especially effective at defining extent of disease, including when multiple patterns of injury are occurring simultaneously. The other major benefit of CT imaging is its utility in therapeutic procedures, including lung biopsy and tissue excision. Lung sampling may be performed by bronchoscopy, transbronchial biopsy (TBB), or video-assisted thoracic surgery (VATS). The role of BAL in diagnosing pulmonary infections also established in non-HIV immunocompromised patients. [56, 57] Some sources suggest transbronchial biopsy in conjunction with BAL in non-HIV immunocompromised patients to detect other processes such as drug-induced lung injury or bronchiolitis obliterans. If outpatient management is possible, arrange for follow-up with a primary care practitioner within 24 hours. Pharmacologic therapy consists mainly of empiric antibiotics awaiting results of diagnostic studies. Taking into consideration each patient's characteristics and risk factors, a narrow differential diagnosis can be established and help tailor therapy to the most likely organism and prevent overuse of anti-microbe therapy. Optimization of treatment of the underlying immunocompromise is a first approach to prevention of pneumonia in immunocompromised individuals. This includes HAART, chemo and radiation therapy, and other measures depending on the type of immunocompromise. However, despite optimal therapy, prevention of opportunistic and endemic pulmonary infections can be difficult. Vaccination against pneumococcal and influenza, as well as prophylaxis against bacteria, viruses, and fungi, are other methods of prevention. In rheumatologic disorders in which corticosteroids and/or immunomodulators such as TNF-inhibitors play a role in symptom control, the optimization of the level of immunosuppression is as important as prophylaxis against microbial infection. How is pneumonia characterized in immunocompromised patients? Which immunocompromised host groups are at highest risk for pneumonia? What are the possible complications of pneumonia in immunocompromised patients? What causes pneumonia in immunocompromised patients? What causes pneumonia in patients with HIV infection? What is the clinical presentation of TB in patients with HIV infection? How is TB diagnosed and treated in patients with HIV infection? What causes bacterial pneumonia in patients with HIV infection? What are the types of fungal pneumonia in patients with HIV infection? How does Pneumocystis jirovecii pneumonia (PJP) develop in patients with HIV infection? Which immunocompromised patients have the highest incidence of aspergillus pneumonia? What causes cryptococcal pneumonia in immunocompromised patients? What causes histoplasmosis pneumonia in immunocompromised patients? What causes coccidioides immitis pneumonia in immunocompromised patients? Which viruses cause pneumonia in immunocompromised patients? How do strongyloides cause pneumonia in immunocompromised patients? What are the risk factors for pneumonia in immunocompromised cancer patients? What are the risk factors for pneumonia in immunocompromised transplant patients? What are the risk factors for pneumonia in immunocompromised patients with autoimmune conditions? What are the risk factors for pneumonia in patients with primary immunodeficiencies? What is the increased risk for pneumonia in immunocompromised patients on long-term steroid therapy? What is the incidence of pneumonia in immunocompromised asplenic patients? Which clinical history findings are characteristic of pneumonia in immunocompromised patients? Which physical findings are characteristic of pneumonia in immunocompromised patients? Which conditions are included in the differential diagnoses of pneumonia in immunocompromised patients? What is the role of lab tests in the workup of pneumonia in immunocompromised patients? 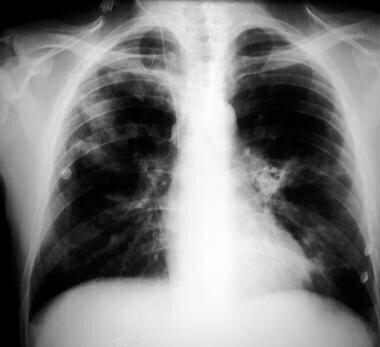 What is the role of chest radiography in the workup of pneumonia in immunocompromised patients? What is the role of chest CT scanning in the workup of pneumonia in immunocompromised patients? What is the role of lung sampling in the workup of pneumonia in immunocompromised patients? What is included in prehospital care for immunocompromised patients with pneumonia? What is the initial ED treatment of suspected pneumonia in immunocompromised patients? Which diagnostic tests are performed in the ED when pneumonia is suspected in immunocompromised patients? How is pneumonia in immunocompromised patients treated? Which specialist consultations are beneficial to immunocompromised patients with pneumonia? What is the role of medications in the treatment of pneumonia in immunocompromised patients? How is pneumonia prevented in immunocompromised patients? Ettinger NA, Trulock EP. Pulmonary considerations of organ transplantation. Part I. Am Rev Respir Dis. 1991 Jun. 143(6):1386-405. [Medline]. Fishman JA, Rubin RH. Infection in organ-transplant recipients. N Engl J Med. 1998 Jun 11. 338(24):1741-51. [Medline]. Ramsey PG, Rubin RH, Tolkoff-Rubin NE. The renal transplant patient with fever and pulmonary infiltrates: etiology, clinical manifestations, and management. 3. Baltimore: Medicine; 1980 May. 59: 206-22. Rosenow EC 3rd. Diffuse pulmonary infiltrates in the immunocompromised host. Clin Chest Med. 1990 Mar. 11(1):55-64. [Medline]. Winston DJ, Emmanouilides C, Busuttil RW. Infections in liver transplant recipients. Clin Infect Dis. 1995 Nov. 21(5):1077-89; quiz 1090-1. [Medline]. Joos L, Chhajed PN, Wallner J, Battegay M, Steiger J, Gratwohl A. Pulmonary infections diagnosed by BAL: a 12-year experience in 1066 immunocompromised patients. Respir Med. 2007 Jan. 101(1):93-7. [Medline]. Hart M, Steel A, Clark SA, Moyle G, Nelson M, Henderson DC, et al. Loss of discrete memory B cell subsets is associated with impaired immunization responses in HIV-1 infection and may be a risk factor for invasive pneumococcal disease. J Immunol. 2007 Jun 15. 178(12):8212-20. [Medline]. Beck JM, Rosen MJ, Peavy HH. Pulmonary complications of HIV infection. Report of the Fourth NHLBI Workshop. Am J Respir Crit Care Med. 2001 Dec 1. 164(11):2120-6. [Medline]. Boyton RJ. Infectious lung complications in patients with HIV/AIDS. Curr Opin Pulm Med. 2005 May. 11(3):203-7. [Medline]. Kanmogne GD. Noninfectious pulmonary complications of HIV/AIDS. Curr Opin Pulm Med. 2005 May. 11(3):208-12. [Medline]. Schneider E, Moore M, Castro KG. Epidemiology of tuberculosis in the United States. Clin Chest Med. 2005 Jun. 26(2):183-95, v. [Medline]. Trends in tuberculosis incidence--United States, 2006. MMWR Morb Mortal Wkly Rep. 2007 Mar 23. 56(11):245-50. [Medline]. Hsieh SM, Hung CC, Chen MY, Chang SC, Hsueh PR, Luh KT, et al. Clinical features of tuberculosis associated with HIV infection in Taiwan. J Formos Med Assoc. 1996 Dec. 95 (12):923-8. [Medline]. Cattamanchi A, Smith R, Steingart KR, Metcalfe JZ, Date A, Coleman C. Interferon-gamma release assays for the diagnosis of latent tuberculosis infection in HIV-infected individuals: a systematic review and meta-analysis. J Acquir Immune Defic Syndr. 2011 Mar 1. 56(3):230-8. [Medline]. Nagu TJ, Aboud S, Mwiru R, Matee MI, Rao M, Fawzi WW, et al. Tuberculosis associated mortality in a prospective cohort in Sub Saharan Africa: Association with HIV and antiretroviral therapy. Int J Infect Dis. 2017 Mar. 56:39-44. [Medline]. Hirschtick RE, Glassroth J, Jordan MC, Wilcosky TC, Wallace JM, Kvale PA. Bacterial pneumonia in persons infected with the human immunodeficiency virus. Pulmonary Complications of HIV Infection Study Group. N Engl J Med. 1995 Sep 28. 333(13):845-51. [Medline]. Polsky B, Gold JW, Whimbey E, Dryjanski J, Brown AE, Schiffman G, et al. Bacterial pneumonia in patients with the acquired immunodeficiency syndrome. Ann Intern Med. 1986 Jan. 104(1):38-41. [Medline]. Witt DJ, Craven DE, McCabe WR. Bacterial infections in adult patients with the acquired immune deficiency syndrome (AIDS) and AIDS-related complex. Am J Med. 1987 May. 82(5):900-6. [Medline]. Park DR, Sherbin VL, Goodman MS, Pacifico AD, Rubenfeld GD, Polissar NL. The etiology of community-acquired pneumonia at an urban public hospital: influence of human immunodeficiency virus infection and initial severity of illness. J Infect Dis. 2001 Aug 1. 184(3):268-77. [Medline]. Ortqvist A, Hedlund J, Kalin M. Streptococcus pneumoniae: epidemiology, risk factors, and clinical features. Semin Respir Crit Care Med. 2005 Dec. 26(6):563-74. [Medline]. Sullivan JH, Moore RD, Keruly JC, Chaisson RE. Effect of antiretroviral therapy on the incidence of bacterial pneumonia in patients with advanced HIV infection. Am J Respir Crit Care Med. 2000 Jul. 162(1):64-7. [Medline]. Helweg-Larsen J, Tsolaki AG, Miller RF, Lundgren B, Wakefield AE. Clusters of Pneumocystis carinii pneumonia: analysis of person-to-person transmission by genotyping. QJM. 1998 Dec. 91(12):813-20. [Medline]. Martínez-Hernández L, Vilar-Compte D, Cornejo-Juárez P, Volkow-Fernández P. [Nosocomial pneumonia in patients with haematological malignancies]. Gac Med Mex. 2016 Jul-Aug. 152 (4):465-72. [Medline]. Tutar N, Metan G, Koç AN, Yilmaz I, Bozkurt I, Simsek ZO, et al. 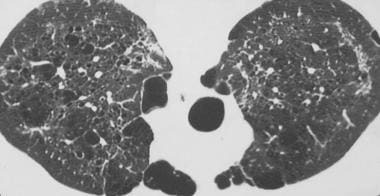 Invasive pulmonary aspergillosis in patients with chronic obstructive pulmonary disease. Multidiscip Respir Med. 2013 Sep 4. 8 (1):59. [Medline]. Samanta P, Singh N. Complications of invasive mycoses in organ transplant recipients. Expert Rev Anti Infect Ther. 2016 Dec. 14 (12):1195-1202. [Medline]. Wasser L, Talavera W. Pulmonary cryptococcosis in AIDS. Chest. 1987 Oct. 92(4):692-5. [Medline]. Wheat LJ, Kauffman CA. Histoplasmosis. Infect Dis Clin North Am. 2003 Mar. 17(1):1-19, vii. [Medline]. Anstead GM, Graybill JR. Coccidioidomycosis. Infect Dis Clin North Am. 2006 Sep. 20(3):621-43. [Medline]. Wallace MR, Hooper DG, Pyne JM, Graves SJ, Malone JL. Varicella immunity and clinical disease in HIV-infected adults. South Med J. 1994 Jan. 87(1):74-6. [Medline]. Keiser PB, Nutman TB. Strongyloides stercoralis in the Immunocompromised Population. Clin Microbiol Rev. 2004 Jan. 17 (1):208-17. [Medline]. Freifeld AG, Bow EJ, Sepkowitz KA, Boeckh MJ, Ito JI, Mullen CA. Clinical practice guideline for the use of antimicrobial agents in neutropenic patients with cancer: 2010 update by the infectious diseases society of america. Clin Infect Dis. 2011 Feb 15. 52(4):e56-93. [Medline]. Rosenow EC 3rd, Wilson WR, Cockerill FR 3rd. Pulmonary disease in the immunocompromised host. 1. Mayo Clin Proc. 1985 Jul. 60(7):473-87. [Medline]. Taplitz RA, Kennedy EB, Bow EJ, Crews J, Gleason C, Hawley DK, et al. Antimicrobial Prophylaxis for Adult Patients With Cancer-Related Immunosuppression: ASCO and IDSA Clinical Practice Guideline Update. J Clin Oncol. 2018 Sep 4. JCO1800374. [Medline]. Nelson R. New Guidelines: Antimicrobial Prophylaxis for Cancer Patients. Medscape Medical News. Available at https://www.medscape.com/viewarticle/902129. September 18, 2018; Accessed: January 7, 2019. Inazawa N, Hori T, Nojima M, Saito M, Igarashi K, Yamamoto M, et al. Virus reactivations after autologous hematopoietic stem cell transplantation detected by multiplex PCR assay. J Med Virol. 2017 Feb. 89 (2):358-362. [Medline]. Kadakia MP, Rybka WB, Stewart JA, Patton JL, Stamey FR, Elsawy M. Human herpesvirus 6: infection and disease following autologous and allogeneic bone marrow transplantation. Blood. 1996 Jun 15. 87(12):5341-54. [Medline]. Wilborn F, Schmidt CA, Zimmermann R, Brinkmann V, Neipel F, Siegert W. Detection of herpesvirus type 6 by polymerase chain reaction in blood donors: random tests and prospective longitudinal studies. Br J Haematol. 1994 Sep. 88(1):187-92. [Medline]. Crocchiolo R, Giordano L, Rimondo A, Bologna M, Sarina B, Morabito L, et al. Human Herpesvirus 6 replication predicts Cytomegalovirus reactivation after allogeneic stem cell transplantation from haploidentical donor. J Clin Virol. 2016 Nov. 84:24-26. [Medline]. Zandman-Goddard G, Shoenfeld Y. Infections and SLE. Autoimmunity. 2005 Nov. 38(7):473-85. [Medline]. Bosch X, Guilabert A, Pallares L, Cerveral R, Ramos-Casals M, Bove A. Infections in systemic lupus erythematosus: a prospective and controlled study of 110 patients. Lupus. 2006. 15(9):584-9. [Medline]. Mecoli CA, Saylor D, Gelber AC, Christopher-Stine L. Pneumocystis jiroveci pneumonia in rheumatic disease: a 20-year single-centre experience. Clin Exp Rheumatol. 2017 Jan 27. [Medline]. Falagas ME, Manta KG, Betsi GI, Pappas G. Infection-related morbidity and mortality in patients with connective tissue diseases: a systematic review. Clin Rheumatol. 2007 May. 26(5):663-70. [Medline]. White DA. Drug-induced pulmonary infection. Clin Chest Med. 2004 Mar. 25(1):179-87. [Medline]. Singh JM, Palda VA, Stanbrook MB, Chapman KR. Corticosteroid therapy for patients with acute exacerbations of chronic obstructive pulmonary disease: a systematic review. Arch Intern Med. 2002 Dec 9-23. 162(22):2527-36. [Medline]. Robinette CD, Fraumeni JF Jr. Splenectomy and subsequent mortality in veterans of the 1939-45 war. Lancet. 1977 Jul 16. 2(8029):127-9. [Medline]. Ramanujam P, Rathlev NK. Blood cultures do not change management in hospitalized patients with community-acquired pneumonia. Acad Emerg Med. 2006 Jul. 13(7):740-5. [Medline]. Mandell LA, Wunderink RG, Anzueto A, Bartlett JG, Campbell GD, Dean NC, et al. Infectious Diseases Society of America/American Thoracic Society consensus guidelines on the management of community-acquired pneumonia in adults. Clin Infect Dis. 2007 Mar 1. 44 Suppl 2:S27-72. [Medline]. Savaş Bozbaş Ş, Er Dedekargınoğlu B, Ulubay G, Haberal M. Role of Serum Procalcitonin Levels in Solid-Organ Transplant Patients. Exp Clin Transplant. 2016 Nov. 14 (Suppl 3):116-120. [Medline]. Kaziani K, Sotiriou A, Dimopoulos G. Duration of pneumonia therapy and the role of biomarkers. Curr Opin Infect Dis. 2017 Apr. 30 (2):221-225. [Medline]. Yan ST, Sun LC, Jia HB, Gao W, Yang JP, Zhang GQ. Procalcitonin levels in bloodstream infections caused by different sources and species of bacteria. Am J Emerg Med. 2016 Dec 10. [Medline]. Onishi A, Sugiyama D, Kogata Y, Saegusa J, Sugimoto T, Kawano S, et al. Diagnostic accuracy of serum 1,3-β-D-glucan for pneumocystis jiroveci pneumonia, invasive candidiasis, and invasive aspergillosis: systematic review and meta-analysis. J Clin Microbiol. 2012 Jan. 50 (1):7-15. [Medline]. Greenberg SD, Frager D, Suster B, Walker S, Stavropoulos C, Rothpearl A. 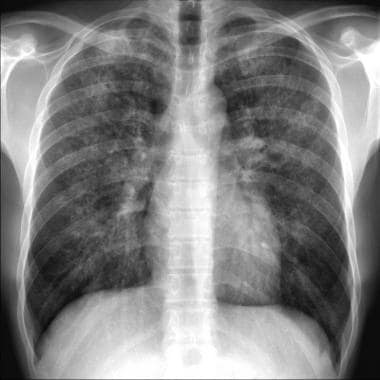 Active pulmonary tuberculosis in patients with AIDS: spectrum of radiographic findings (including a normal appearance). Radiology. 1994 Oct. 193(1):115-9. [Medline]. Rano A, Agusti C, Sibila O, Torres A. Pulmonary infections in non-HIV-immunocompromised patients. Curr Opin Pulm Med. 2005 May. 11(3):213-7. [Medline]. Fan LC, Lu HW, Cheng KB, Li HP, Xu JF. Evaluation of PCR in bronchoalveolar lavage fluid for diagnosis of Pneumocystis jirovecii pneumonia: a bivariate meta-analysis and systematic review. PLoS One. 2013 Sep 4. 8 (9):e73099. [Medline]. Hohenadel IA, Kiworr M, Genitsariotis R, Zeidler D, Lorenz J. Role of bronchoalveolar lavage in immunocompromised patients with pneumonia treated with a broad spectrum antibiotic and antifungal regimen. Thorax. 2001 Feb. 56 (2):115-20. [Medline]. Rañó A, Agustí C, Jimenez P, Angrill J, Benito N, Danés C, et al. Pulmonary infiltrates in non-HIV immunocompromised patients: a diagnostic approach using non-invasive and bronchoscopic procedures. Thorax. 2001 May. 56 (5):379-87. [Medline]. Kropski JA, Pritchett JM, Mason WR, Sivarajan L, Gleaves LA, Johnson JE, et al. Bronchoscopic cryobiopsy for the diagnosis of diffuse parenchymal lung disease. PLoS One. 2013 Nov 12. 8 (11):e78674. [Medline]. Tomassetti S, Cavazza A, Colby TV, Ryu JH, Nanni O, Scarpi E, et al. Transbronchial biopsy is useful in predicting UIP pattern. Respir Res. 2012 Oct 29. 13:96. [Medline]. Newberry L, O'Hare B, Kennedy N, Selman A, Omar S, Dawson P, et al. Early use of corticosteroids in infants with a clinical diagnosis of Pneumocystis jiroveci pneumonia in Malawi: a double-blind, randomised clinical trial. Paediatr Int Child Health. 2017 Feb 1. 1-8. [Medline]. Vaglum P, Friis S, Vaglum S, Larsen F. Comparison between personality disorder diagnoses in DSM-III and DSM-III-R: reliability, diagnostic overlap, predictive validity. Psychopathology. 1989. 22 (6):309-14. [Medline]. Wang LI, Liang H, Ye LI, Jiang J, Liang B, Huang J. Adjunctive corticosteroids for the treatment of Pneumocystis jiroveci pneumonia in patients with HIV: A meta-analysis. Exp Ther Med. 2016 Feb. 11 (2):683-687. [Medline]. [Full Text]. Dohn MN, White ML, Vigdorth EM, Ralph Buncher C, Hertzberg VS, Baughman RP. Geographic clustering of Pneumocystis carinii pneumonia in patients with HIV infection. Am J Respir Crit Care Med. 2000 Nov. 162(5):1617-21. [Medline]. Bultink IE, Hamann D, Seelen MA, Hart MH, Dijkmans BA, Daha MR. Deficiency of functional mannose-binding lectin is not associated with infections in patients with systemic lupus erythematosus. Arthritis Res Ther. 2006. 8(6):R183. [Medline]. Yoshikawa T. Human herpesvirus 6 infection in hematopoietic stem cell transplant patients. Br J Haematol. 2004 Feb. 124(4):421-32. [Medline].